Scott Arford is one of the leading figures of new media arts in the San Francisco Bay Area. He has produced numerous works for sound and video including multichannel installations, live performances, CD and DVD projects. 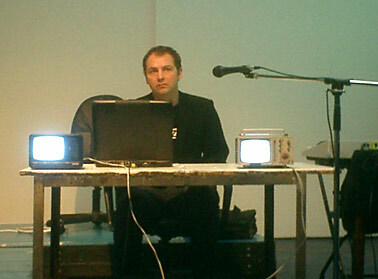 He was awarded an Honorable Mention in the 2005 Prix Ars Electronica. Arford has shown his in numerous venues including the San Francisco Museum of Modern Art; Dissonanze 7 in Rome, Italy; LUFF Festival in Lausanne, Switzerland; Observatori Festival in Valencia, Spain; the Sounding Festivals in Guangzhou, China and Taipei, Taiwan; the LEM festival in Barcelona, Spain; Liquid Architecture in Melbourne, Australia; the Festival de Video / Arte / Eolectronica in Lima, Peru; Sonic Light in Amsterdam; and the Center for Contemporary Arts in Kitakyushu, Japan. Arford holds a Bachelor of Architecture from the College of Architecture and Design at Kansas State University. In 1995 Arford founded 7hz, a warehouse/performance space dedicated to supporting live electronic experimental media. 7hz has since featured such international artists as Francisco Loppez, Zbigniew Karkowski, John Duncan, Bob Ostertag, John Bischoff, The Haters and more.